Couldn’t resist researching this one. The Original Sloppy Joe Sandwich was invented at Sloppy Joe’s Bar in Key West. The bar opened the very day that Prohibition was repealed, and it was a favorite of Hemingway. I personally think that the first person to make one was named Joe, and the sloppy part pretty much explains itself! 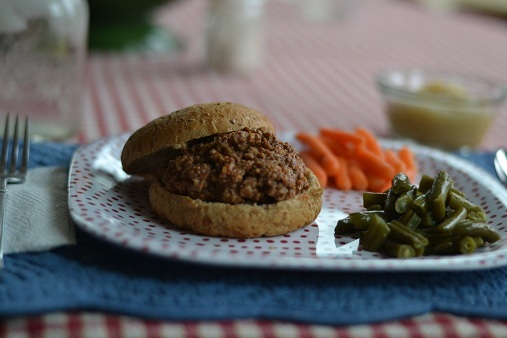 There are different ideas as to how the name “Sloppy Joe” evolved. The one that I have always known to be true is that Joe was the name of an Iowa cook in one of Floyd Angell’s restaurants who helped develop the concept. Marilyn Brown, Director of the Consumer Test Kitchen at H.K. Heinz in Pittsburgh says their research at the Carnegie Library suggests that the Sloppy Joe began in a Sioux City, Iowa, cafe as a “loose meat sandwich” in 1930, the creation of a cook named Joe. Here in Australia a Sloppy Joe is like a tracksuit top. Also called a jumper or a pullover. Usually worn for doing gardening or some other dirty work. I’ve wondered for years why Americans eat pullovers. This just made me laugh out loud! I can just imagine the looks on your family members’ faces! thank you so much for this recipe. have been looking for a good one for s.j.’s. and i KNOW yours will be good. Hope you still get this, but as I know it the Maid-rite is different than a sloppy joe. Maid-rites began in Iowa. A maid-rite is steamed hamburger with some salt and pepper perhaps some onion. You added the condiments on your sandwich. The sloppy joe has ketchup, chili powder, onion, and all the seasonings in the meat. Yes, correct Lois, MaidRites are simply steamed ground beef…we Iowans call a sloppy joe, a sloppy Joe. We love sloppy joes at our house! They are so tasty and so easy. Here in PA I have heard them called sloppy joes, steamers and also beef barbecue. Maybe we’ll try your recipe tonight. Thanks. The buns in the pic look great! any chance I could get your recipe? I’ve been trying to find something good for sandwiches. Here’s the link to the bun recipe! Yum! That looks so so good. I am so glad you posted this recipe! Sloppy Joes are on the menu for next week! I grew up in Northeast Nebraska and we called them tavern as well. When I was in college and served them, no one knew that I was talking about. One of my friends from Southeast Nebraska calls them loose meat sandwiches. Some girls would put biscuits in a cupcake tin, add meat mixture and cheese and bake the popovers until brown. Yum! Yummy, I might try these!! Would you believe I am in the process of cooking up 6# of sloppy joes for Sunday night’s college student supper?! The recipe I usually make (vs. BBQ sauce in a bottle) is very similar to yours, but has brown sugar and chili powder instead of garlic and mustard. Oh, and Maid-Rites don’t have BBQ sauce as far as I know. Just browned ‘loose meat’ with onion, salt and pepper – sometimes beef broth but enough salt and meat juice serves the purpose. Then you add ketchup, mustard, pickles, onions, etc. when served. I’m from SD and, like Sonja reported, they are called Taverns in SD. Isn’t it fun the different names we give to food and other items. Hey you South Dakotans, hi there! I grew up in Montana and we called them sloppy joes. Working with my kids in the 4H food booth when we lived in SD, taverns were on the menu. Since we were selling them, I thought I should know what they were. They showed me, and I said, “These are sloppy joes!” And lots of people buying food would ask what a tavern was. So not every SDan calls them taverns, and no one I asked knew how they got their name. Maybe they are only called taverns when they’re sold at the fair! Tried out this recipe for Sloppy Joes last night. It’s a Keeper! Thanks! My family calls them “wimpies” and I don’t know how they got that name, either! The best way to eat sloopy joes, however, is not on a bun or a spoon, but on a thick rippled potato chip. Yum. We love Sloppy Joes here at my house. They are a standard freezer meal for me now. I am making your Sloppy Cornbread version tonight…can’t wait! Very easy and tasted good. 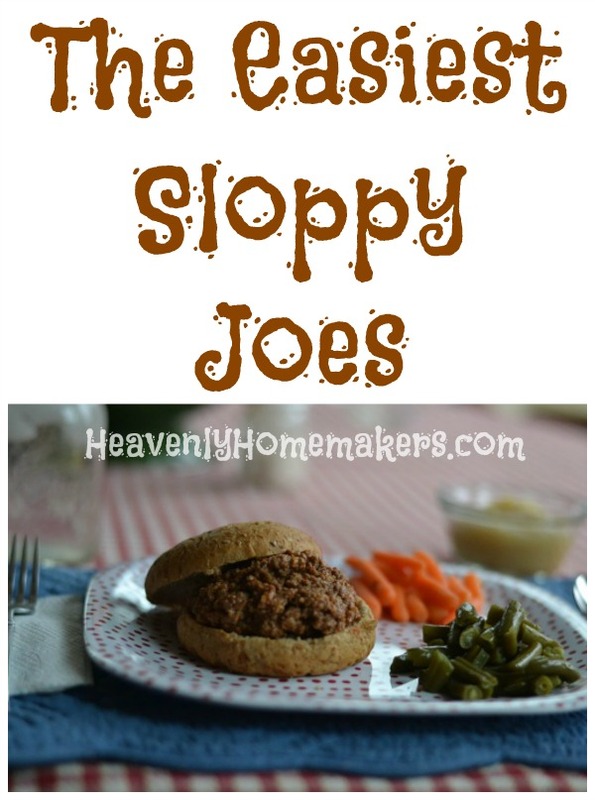 This is the only sloppy joe recipe I have been able to get my kids to eat. I made it with ground turkey. We haven’t had sloppy joes in sooooo long. I’m going to try this recipe. I’ve been interested in making my own ketchup too and can’t wait to see what you come up with!!!! Thanks for sharing your homemade recipe! In case your boys are like mine and do not like to eat “leftovers”, try this disguise! For the next meal night, try adding brown rice, cheese, and some spices (I use Emeril’s Essence recipe.) They love it! OK, I’m from SE South Dakota, we call them Bar-B-Q’s or Taverns. My aunt went down south somewhere and ordered a Bar B Q and expected our familiar tavern and got some bowl of hog meat. My wife is from west river, SD. They call them Wimpies. I taught school in NW SD for years and they called them Wimpies. I also taught around Sturgis. In the Pennington County and Meade County area I know they called them “Steam burgers”. Amazes me they have so many names, but you can peg where you come from in SD by what we call them, but we definately do not all call them Taverns, In SE SD when they are served for school lunch they’re called Bar-B-Q’s not taverns. I love this recipe! We take rolls and put homemade garlic butter on top and then broil it to make garlic toast so to speak. Then we put the sloppy joes on! The garlic bread adds a lot of flavor. I actually even liked them while still dealing with nausea due to pregnancy so that says a lot. Question – does the ketchup you buy have better quality sugar in it? I ask because Trader Joe’s brand is cheaper than the link you sent. $1.99 per bottle. The one you sent ends up being about $3.33 per bottle but I think it is worth it if the sugar is better (well as better as it can be when it comes to sugar). Here are the ingredients – Trader Joe’s Organic Ketchup: Organic tomato puree, organic sugar, salt, organic white vinegar, organic onion powder, organic spices. This is the ingredient list to the brand you put a link in for. Tomato Puree (Organic), (Tomato Paste (Organic), Water), Naturally Milled Sugar (Organic), Vinegar (Organic), Sea Salt, Onion Powder (Organic), Garlic Powder (Organic), Cayenne Pepper (Organic), Oils of Cove, Cassia and Celery. It seems like yours might taste a bit better looking at the ingredients but in saving $1.33 per bottle I might have to go with less flavor unless it is better to have the naturally milled sugar. Thanks for all your great recipes and your nutritional info! I just have to chime in on this ketchup sub-thread. ketchup, which I get through our local UNFI buying club. It sounds to me as if upper-midwesterners are very confused about their sandwiches in general! In TN, everyone knows what a sloppy joe is, but I’ve never heard of any of those other possibilities. I make sloppy joes about every other week, and my recipe is just about like yours, except it also has 1 T of vinegar. Everyone at my house likes them very much. I think they would like the cornbread option too. And of course, BBQ is slow-cooked pig with sweet sauce. It has nothing to do with sloppy joes, hamburgers, or beef in general. My inlaws in IN think BBQ is a process rather than a food, and they think it involves hamburgers, hot dogs, and polish sausage. So wrong. And also – it is not possible to cook real BBQ and comply with the health codes. The very best comes from rural gas stations with screened-in pits out back. Look for them in west TN and all over MS too. Could you tell me whether the mustard is dried mustard or prepared mustard? Thanks. You could use dried mustard, but what I was refering to in the recipe is the prepared mustard. Sorry I wasn’t specific! Thank you, Laura. We tried these and thought they were good. dried. Thanks for the recipe! We love sloppy joes, and when we lived in China we had ONE lovely sloppy joe meal, using a can of the mix we’d found at the ‘western store.’ We probably paid about $5 for that one can. (I didn’t know then how to make things from scratch.) It was during that meal that I discovered our favorite side dish to serve with sj’s: homemade french fries sprinkled with garlic salt! My husband grew up with manwich(tomato base) sloppy joes…I hate manwitch. I grew up with a mom that could stretch a pound of hamberger a mile long. She use baked beans as a base and added ketchup or sometimes BBQ sauce and what ever else she had…onions, wostishire, or sometimes when we were out of everything else homemade chili sauce or mustard(mustard never tasted right). I LOVE my/mom’s sloppy joes but he doesn’t I’ll try this tonight and see if this can be a happy compromise. Does anyone remember the TV show Family Affair? The butler Mr. French called them “Untidy Samuels” I always think of that when I hear about sloppy joes. Bon Appitete! or Dig In! Now this is a recipe that should pressure can quite well! :) I got a bunch of ground beef on sale, so I think I’ll make some of this tomorrow and can it. I’m happy to see a recipe for sloppy joes (or Untidy Samuels – that’s cute) that isn’t full of green pepper. At what pressure and amount of time would you use to pressure can this? I am still leaning and processing times and pressures are still a little tricky for me. It is so different from the hot water bath! I process pints for 75 minutes and quarts for 90 minutes. The pressure depends on your altitude – for me, it’s 10 PSI. I find that the pressure canner is so much simpler than a boiling water bath. I ended up making all meatballs, though, and no Sloppy Joes. I made this tonight with ground chicken. I only used 1 lb meat, left the sauce the same, and added 1 cup cooked brown rice and it was perfect! I am a michigander and though most people here call them sloppy joes, many call them B.B.Q.’s. We made your Sloppy Joe’s this evening and they were a HUGE HIT! My 15 year old would never eat the Manwhich ones but he liked these alot. Yes, you could leave it on the counter or put it down into some hot water to start it defrosting. Once the water cools, replenish it with hot water again. Once enough has thawed to get it out of the jar (or bag) go ahead scoop it out into a sauce pan and heat in on low heat on the stove. Beware though, if your frozen sloppy joe meat is in a jar, don’t just stick the jar in hot water right away or you risk your jar cracking! Run it under cool water first. I was so excited to make these tonight, but I got out my (old) bottle of Worchestershire sauce and there’s high fructose corn syrup in it. Ugh. I have a feeling they wouldn’t be very good if I left it out. Is there a better brand you use? It’s not something I use often, so I’ve never looked for a good replacement before. I ended up buying the Lea & Perrins brand. Ingredients: distilled white vinegar, molasses, water, sugar, onions, anchovies, salt, garlic, cloves, tamarind extract, natural flavorings, chili pepper extract. I was actually pretty happy with that…no corn syrup at all! And the sloppy joes were DELICIOUS!! Thanks for another wonderful recipe! Apple cider vinegar, Molasses, soy sauce, garlic powder, onion powder, salt, clove ,chili powder, water. I wish I could tell you the amounts, it kind of depends on the amount I am making, and I taste as I go til it’s just right. I did not have worchestershire sauce on hand, but had some Eden organic Tamari soy sauce. I’ve replaced worchestershire sauce with the soy sauce in beef stew before and it turned out great. So, I gave it a try. We loved it! I LOVE LOVE LOVE this recipe! Manwich is my favourite favourite thing ever. I was sad when I started reading labels that I was never going to have Manwich ever again. This tastes just like it to me and I’m sooooo happy I came across this recipe! I grew up Catholic and the nuns used to call them Disorderly Joseph’s…can’t wait to try the recipe. YUM! This is WAY better than canned sloppy joe sauce. My kids are 2 for 2 with your recipes. THANK YOU!! I have tried other recipes and always fall back to manwich, not because it was the best but because we couldn’t find any better, tried your recipe tonight and we all loved it!! It was so simple and things we already have in the house, made for a fast dinner and even my picky daughter who hates everything including sloppy joes loved this too!! Sounds like a great recipe! How long can you freeze the Sloppy Joe mix? great recipe. we use this to make our sloppy joes. will never go to any other recipe. this is just too yummy and so much better than the ones with the added garbage in it. 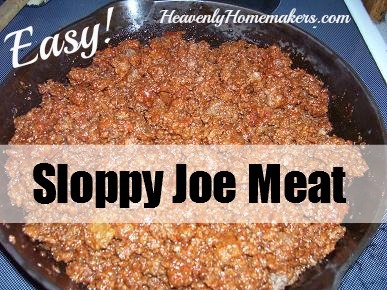 I have to say, I was searching how to make home made Sloppy Joes… Some recipes were too complicated, and honestly just a lot of unnecessary ingredients that I didn’t have either. However, falling upon this recipe, it’s amazing!!! In the beginning, I was kind of unsure when I tried it, because yes, it is quite a big mess of everything, but until you try it don’t judge it!! I love this recipe, and also have to say that, you my friend, have reached Elegance and Simplicity in one big hit!!!! Great Recipe and I recommend it to all!!!!!! I finally got a chance to try this recipe today! We liked it so much I blogged about it and linked to your recipe. I also borrowed your picture of the sloppy joes mix for the post. Hope that’s okay. I tried these today and we all loved them. I will make a batch for our vacation. Thank you for sharing. How many does this recipe feed? This does not seem to be enough for the 40 or so athletes you host. Thanks so much for sharing your great recipes! This recipe makes 8-10 Sloppy Joes. Two questions, firstly, did you use dried minced onion or fresh onion? Secondly, approximately how many sandwiches do you get from this recipe? Thanks. My recipe is very similar but uses less ground meat. This past Sunday we made Sloppy Joe Calzones using your Calzone recipe. They were yummy!